Whenever the school holidays loom closer, do you find yourself thinking of ways to get your kids off their devices and go outside for once? A trip somewhere remote yet family- and kid-friendly seems like an obvious solution, but where to? Fiji is your answer! Gorgeous beaches, rich tropical jungles and thrilling adventures await on Fiji’s 333 islands in the heart of the South Pacific. 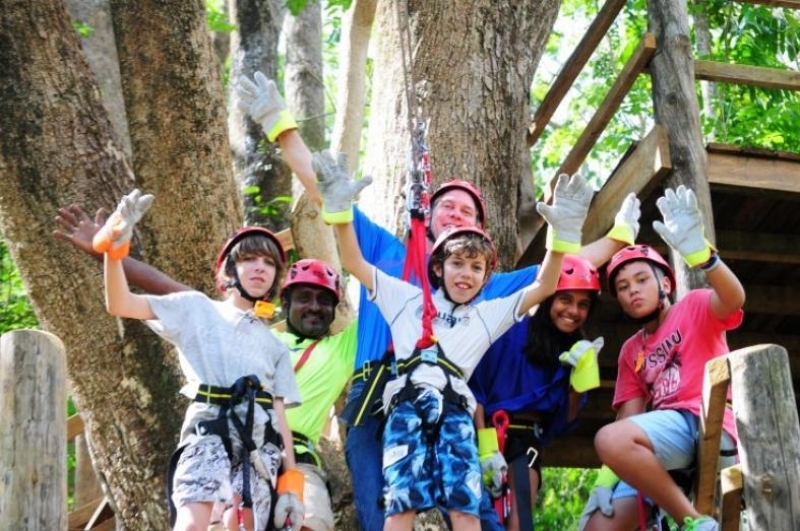 The best part is that you’ll have no trouble trying to pry any phones or tablets from your children’s grasps, as they will surely be more than happy to have a blast with all the fun-filled activities that Fiji has to offer! You might be surprised to find out just how family-friendly Fiji can be, but we’re about to prove it to you by giving you nine of the best activities in Fiji that you can enjoy as a family. 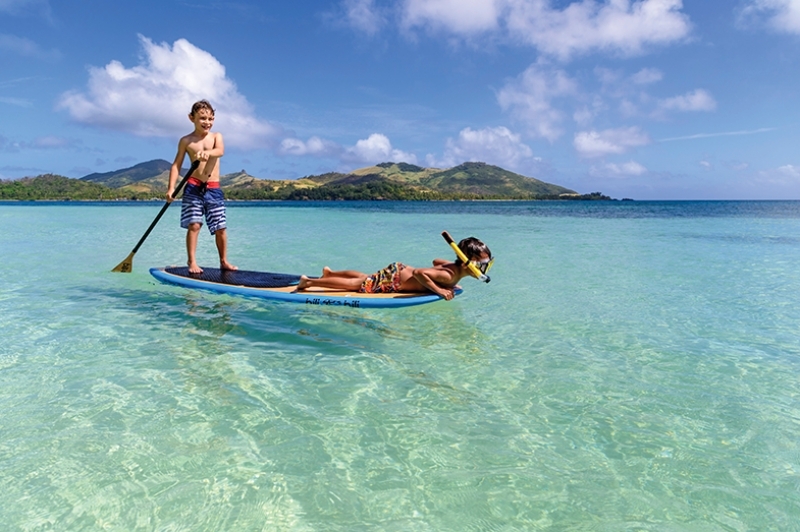 Discover for yourself all the fun your family could be having in Fiji. Get a head start into the action by embarking on an 8D6N Bula Fiji Escape Small Group Tour organised by Chan Brothers. From S$1,988, this package includes a return flight on Fiji Airways, a traditional shell lei welcome, accommodation at DoubleTree Resort by Hilton Hotel, as well as enriching day tours. With all the nitty gritty planning settled for you, you can give all your focus to having fun with the family on your Fiji vacation! After an enjoyable ride over with Fiji Airways, your flying for the day doesn’t have to halt there. 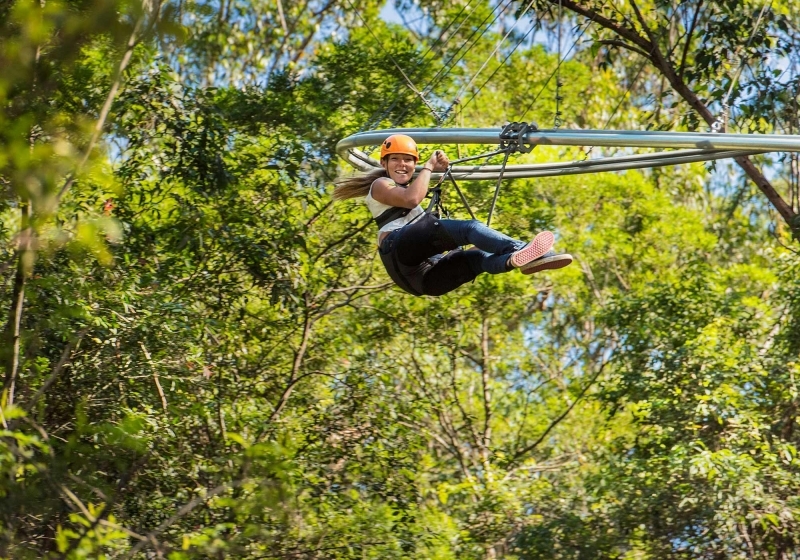 Continue your soaring adventures at Sleeping Giant Zipline, an eco-friendly adventure park featuring ziplines and the enchanting jungle waterfalls in the Orchid Falls Jungle Safari. It’s a sure-fire way of exciting your children, as they’ll have unlimited chances to zip down five different routes at speeds of up to 40 km/h. Whatever tiredness they may be experiencing from the flight will soon be forgotten due to all the adrenaline rushing through their veins! Good morning, or ni sa yadra, as they say in Fiji. You must’ve retired to the resort pretty early after that entire day of flying. This morning, kickstart a new adventure by having the family head out to Tivua Island on a cruise. 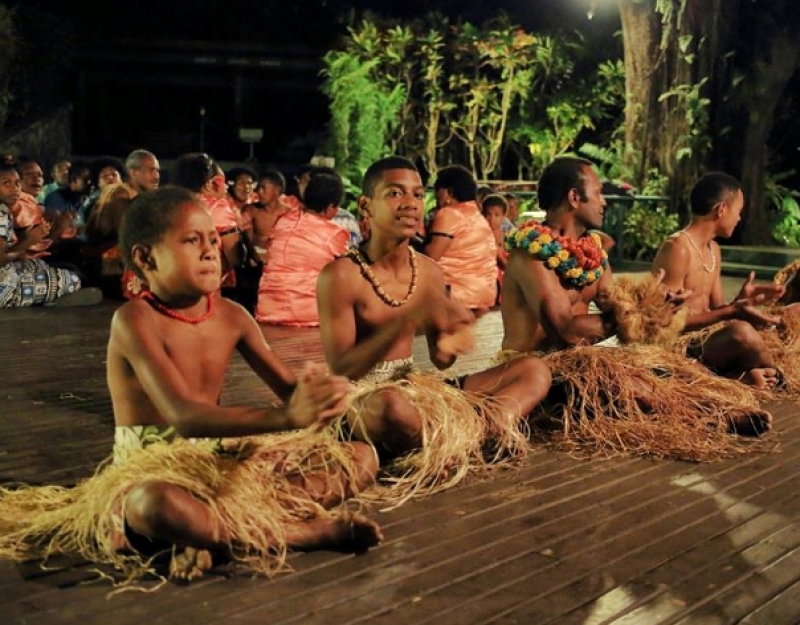 Take this all-inclusive full-day trip to Tuvia Island early on during the trip, as it’s a good way to introduce your kids to Fiji’s culture and way of life before you explore the rest of the islands. 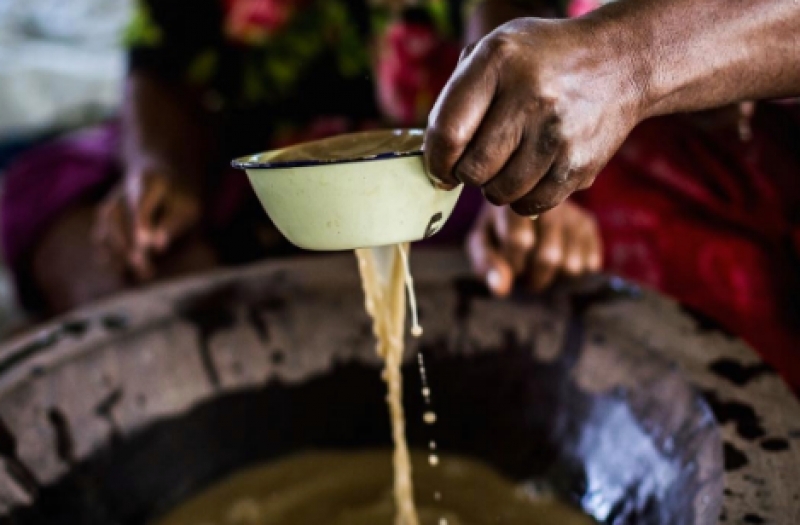 It’ll be a day full of wonder as the whole family learns about Fijian culture through activities such as the traditional kava ceremony (a custom of serving a drink made from kava root, considered to be Fiji’s national drink), coconut husking, and basket weaving. There’ll also be plenty of music and performances that’ll get you moving on your feet! Besides the newfound knowledge about Fiji’s culture and people, Tivua Island will also keep your kids engaged through its many island and water activities. Snorkelling, canoeing, feeding the fishes – you name it! There’ll definitely be something to make your little ones realise just how much fun one can have when they’re close to nature and wildlife. Despite the full day at Tivua Island, the encounters with wildlife you got there is only a teaser for what’s to come at Kula Wild Adventure Park, also known as the Kula Eco Park! 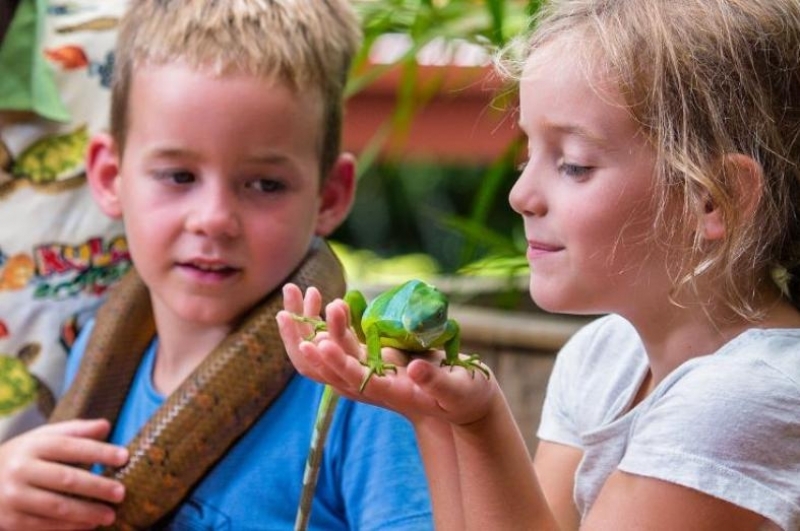 At Fiji’s only wildlife park, snap photos of your kids with the the non-venomous Pacific boa and the Fiji banded iguana, endemic to the Fiji Islands. Take this golden opportunity to feed the young hawksbill turtles at 11am, 1pm and 3.30pm daily, as Kula is one of the few places you’ll get to see these endangered creatures up close. This chance to let your kids interact with wildlife and learn more about the threats to their survival as well as conservation efforts in Fiji is definitely hard to come by otherwise. The fun doesn’t quite end there – hop on Kula’s Krazy Canopy Flier! It’s a thrilling zip down a roller coaster rail that’ll bring you through the forest. What’s more, adventurous kids can try out Kula’s Splash Mountain Jungle Slide, while the little ones can still have fun playing in the Kiddies’ Splash Pool. Just a short 30-minute ride away is Ecotrax Fiji, where you can spend some quality family bonding time on the world’s only rail-mounted, electric-assisted push bike. Set your pace as a family unit as you pedal through the lush forest, rock cuttings and other beautiful surroundings that Fiji has to offer. After all that pedalling, you’ll get to stretch your legs and rest up at the end point: a remote beach where you’ll be treated to cerulean waters and snacks, including refreshing coconut drinks! 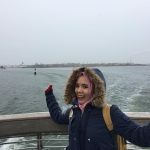 Be sure to book your slot at least a day in advance as this attraction is quite popular and trips currently only depart twice daily. Another new day in Fiji calls for another way to spice up your vacation, and splashing about at the Big Bula Waterpark will do just that! 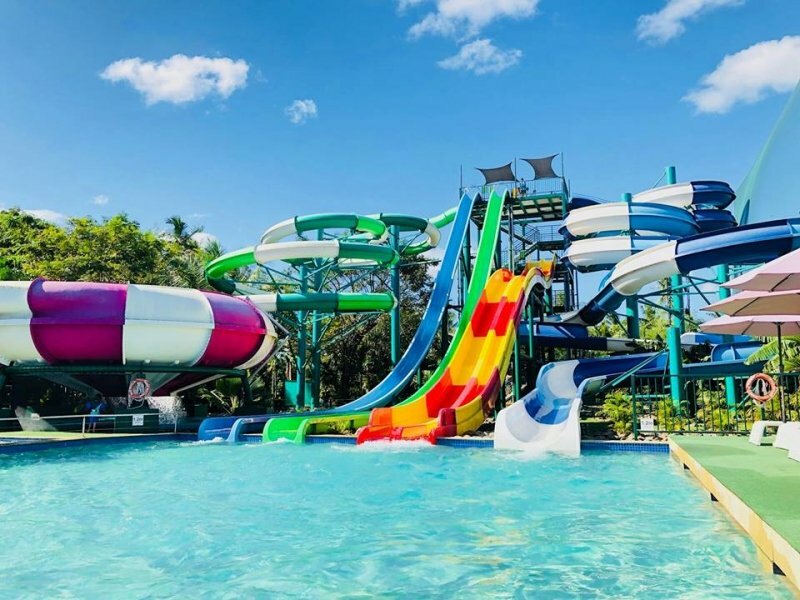 It’ll be your kids’ dream come true to have a go at the giant water slides and huge surfing waves, as well as fun and exciting obstacle courses to race through. On the Big Bula Waterpark grounds you can also find the world’s largest inflatable water park for you to enjoy. After your splashing adventure, there’s no need to dry off too quick; you’ll still need your swimsuit on when you head over to the Sabeto Hot Springs and Mud Pool. Delight in the opportunity for your family to bathe in a communal setting – a natural thermal mud spa, no less! It’s believed that taking a bath in the mud pool is the perfect remedy to cleanse and beautify yourself in a natural manner. Here’s your chance to apply mud onto your family members – be it out of jest or love! Before leaving, wash away both mud and your worries by taking a soak in the hot springs. 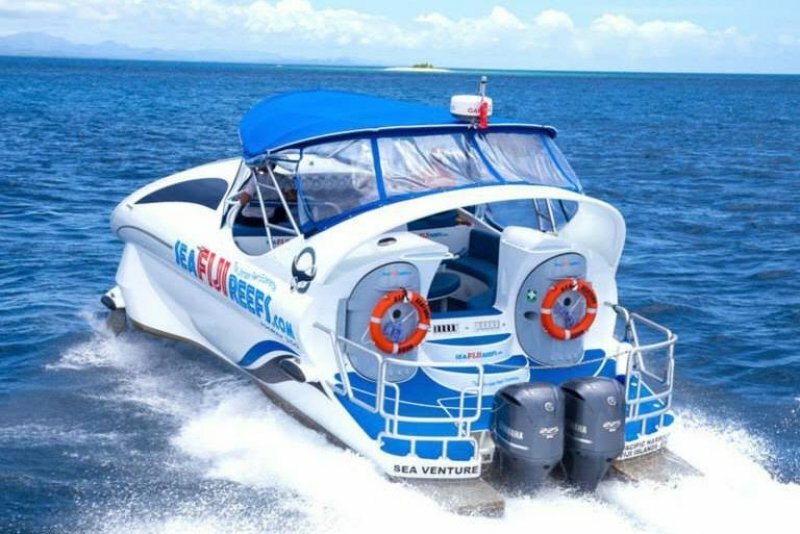 Venture out into the Beqa Lagoon on the other side of Fiji with Sea Fiji Reefs, as you climb aboard Sea Venture, a high-speed boat with a massive 2-meter by 3-meter viewing port where you can admire the incredible reefs and marine life that roam underwater. Spot a diverse variety of marine life such as stingrays, groupers, turtles and many more on your tour. 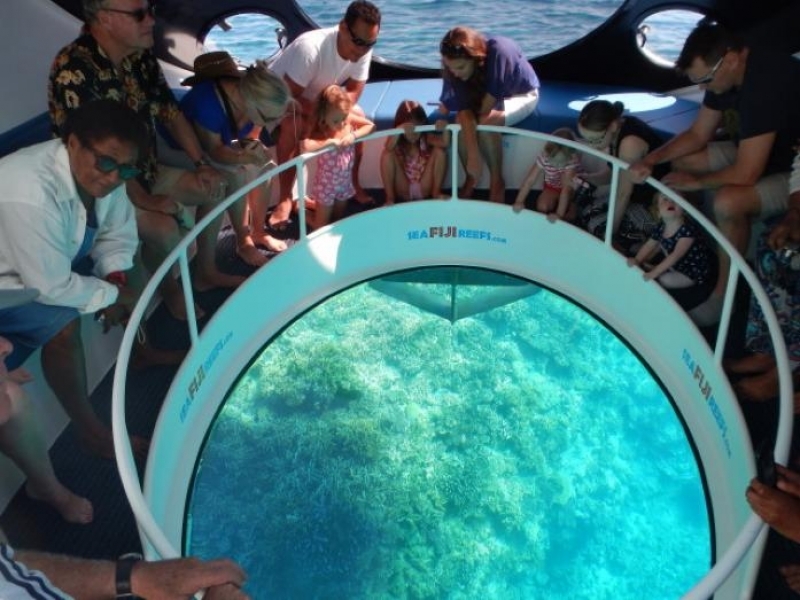 You can choose for the family to experience a day tour with or without the opportunity to snorkel, or even a sunset-and-night tour which will grant you a different view of the sea life here. 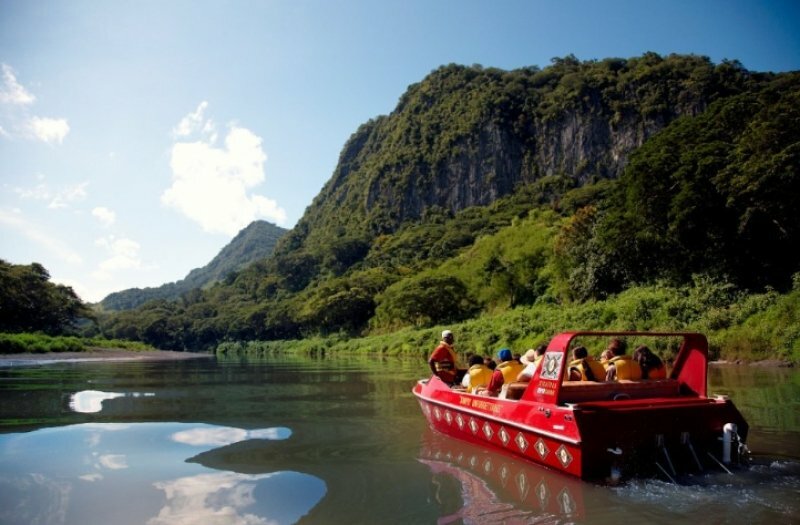 With all the fun you’ve been having on your family vacation, you’ll finally be ending off your adventures in Fiji on a half-day Sigatoka River Safari Tour. It’s an eco-cultural adventure down the amazing Sigatoka River, the longest river on the island of Viti Levu. 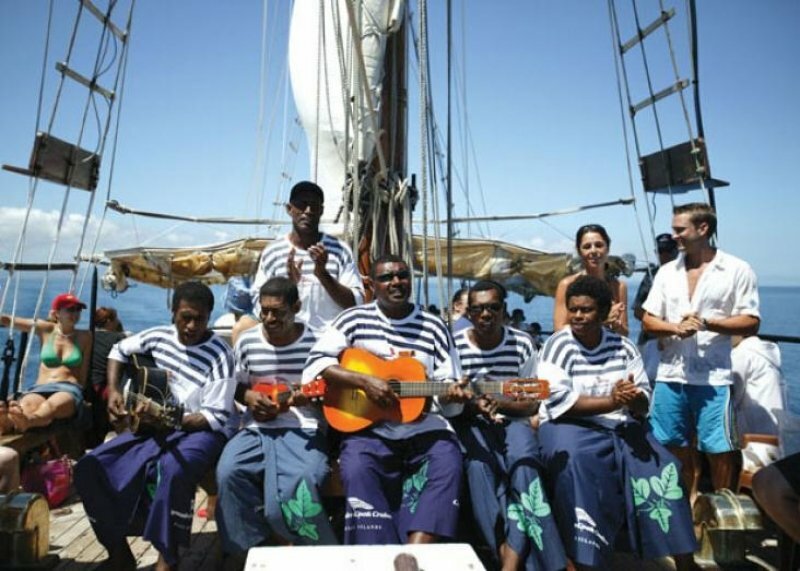 Experience Fiji’s heartwarming hospitality for the last time during a Fijian lunch and kava ceremony, as well as their lovely singing and dancing performances. It’s time to say goodbye to this friendly and effervescent island, but on the bright side, you’ll be taking unforgettable memories with the family back home. So head over to Fiji now to embark on your fun-filled family vacation! To ensure you have an enriching and enjoyable time in Fiji, join in on Chan Brothers’ 8D6N Bula Fiji Escape Small Group Tour. Enjoy an all-inclusive package including a return flight on Fiji Airways, traditional shell lei welcome, accommodation at DoubleTree Resort by Hilton Hotel with daily breakfast, as well as day tours, from just S$1,988. Let happiness find you and your family in Fiji when you travel with Chan Brothers on March 16, April 13, May 18 and June 15 2019.